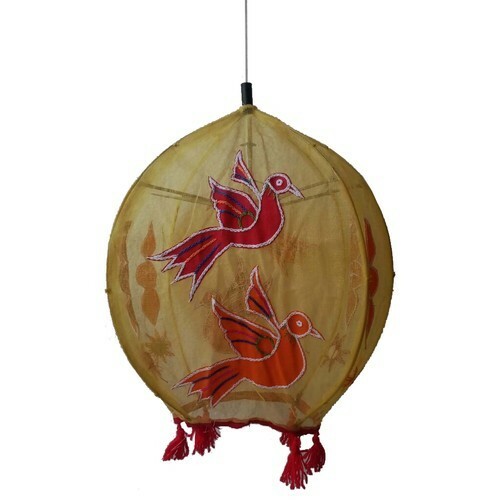 Fine Decorative Cloth Round Lamp Hanging Available In Different Designs & Sizes. Guided by our experts, we have been manufacturing, exporting, wholesaling and supplying a range of Handicrafts manufactured using wood, sand and other materials. Range of products being offered by us is Handicraft Items, Wall Hangings, Indian God Statue, Indian Sculpture, Marble Statue, Marble decorative, Marble articles, Wooden Handicrafts, Ceramic Handicrafts, Marble Handicrafts, Iron Products, Iron Items, Lac Products, Brass Products, Bone Products, Home Decor, Marble Sculpture,Glass Lamps, Brass Hukkas, Bone Accessories, Brass Sculptures, Brass Products, Camping Equipment, Glass Items, Copper Items, Key Chains, and others. Our expertise in crafting and creating a handicraft item has helped us to match the artistic requirements of numerous clients in Indian and International market. Providing a proper environment to professionals working with us to cater their artistic skills to art lovers, we have been able to serve Indian art and artists in the best possible way. We are majorly looking for International Queries.